This article was originally published in Hand to Hand, (Volume 13, Number 4, Winter 1999), a quarterly publication of the Association of Youth Museums. Reprinted with permission from the Association of Youth Museums, Washington, DC. For people who speak the same language, the ability to communicate to others is taken for granted. Some people may be shyer than others, but at least they understand what’s being said and can respond. For a growing segment of the population in many countries, language barriers pose a problem that even the greatest amount of confidence cannot overcome. At the Canadian Children’s Museum an increasing number of “new Canadians” – especially young teenagers – participate in museum programmes to help them improve their language skills and learn their way around a new culture. What effects do children believe museums have on them, and what are children getting in our museums they are not able to get elsewhere? Children get an opportunity in museums to learn about themselves and others that they do not get anywhere else. Do museums provide the tools to help them communicate? Opportunities to practice using the tools to express themselves? Or help them define their place in the world? The Canadian Children’s Museum (CCM) offers young volunteers a place to develop themselves and the tools to help them fit in. I recently spent time discussing these questions with two young volunteers – Dinora Cabrera and May Jabara – who willingly shared their personal experiences and discussed how their lives were changing as a result of visiting and ultimately volunteering at the CCM. The CCM is devoted to cultural diversity and is part of the larger Canadian Museum of Civilization (CMC), located in Canada’s National Capital Region, in Hull, Quebec. As a national museum, funded by the Canadian government, the CMC including the CCM, has a responsibility to all Canadians to preserve their heritage and to communicate an understanding of that heritage to citizens. For CCM this means: one, that we serve not only a regional audience on site, but also reach out to other Canadian children; and two, that Canadian are reflected in all our programmes and exhibitions. The CCM’s mission, which reflects Canada’s cultural diversity, seeks to promote intercultural understanding amongst children and to enrich their lives, to broaden their cultural experience, and to provide them with a creative space in which to learn about the world. Exhibitions and programmes focus on the appreciation of cultural similarities and differences and the creative and adaptive nature of children. A diverse youth volunteer corps – comprised of youth ages twelve to sixteen – participates in the planning and implementation of programmes. This allows individuals from the cultural communities to have a voice and an opportunity to share their expertise with the visitor. In trying to get an idea of what the CCM has meant to both its visitors and to the young volunteers who have enthusiastically spent hours there, I present the views of two young people, who are part of a Youth Volunteer Programme. Since 1995, over ninety young people have participated in this programme, contributing over seventy-five thousand hours after school and on weekends to the CCM. These young volunteers have represented the museum at community events and festivals, and in a diversity of other special activities. Dinora Cabrera, 13 years old, and the youngest of three children, was born in El Salvador. She came to Canada with her family at the age of six. In addition to volunteering her time at the CCM for last half year, she treasures her time with friends, swimming, and bicycling. Her time alone is spent learning the piano and painting. She is very close to her mom, Blanca. “I came here once with my mom,” she explains, “and two times on school field trips.” The experience of being able to touch things and see how things work left a big impression on her. It was her mom, however, who told her of the Youth Volunteer Program. Dinora enjoyed her previous visits so much she decided that as soon as she turned twelve she would apply. Her mother has been volunteering for two years; in fact, they volunteer together. While Spanish is Dinora’s first language, she is also fluent in English and French. May Jabara, age 16 is currently in grade 11. Born in Lebanon and came to Canada with her parents at the age of 6. There are four brothers and one sister in her family. She has been volunteering once a week for the past half year. How did she find out about the CCM? “We used to come as a family many times,” she says. “I remember coming here in grade 3 on a school field-trip. 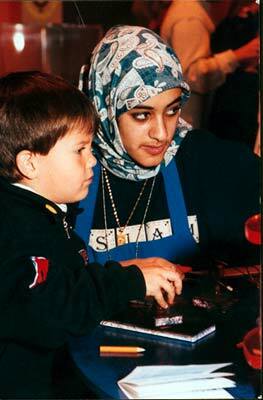 I still remember it.” Although she is an active participant, volunteering at the museum was not her first choice. When May first decided to get a part-time job, the CCM came to mind. She brought in her resumé to the museum and spoke to a museum employee, who suggested that she would better her chances of getting a job is first volunteered. May was seeking opportunities to overcome her shyness. “When I come here, it is because I choose to: being at the museum is a choice.” She can be herself without the pressures of school and parents. Though she likes school sometimes, she finds it difficult. Youth who have mastered their volunteering skills and talents are eligible to join the museum as summer students, many stay with us 2 to 3 summers, while others have gone on to be offered paid positions in their community that involves children’s programming. These two young people had very particular views about their museum experience and their place in the community. Dinora, for example was very aware that she represented the modest Salvadorian community and by extension, her position within that community. “My mom and I go to many cultural activities, [but] this is the only place I volunteer. My parents are proud of what I do here at the museum.” Dinora had visited many other local museums and liked the CCM’s approach to getting children engaged in learning. At school, she excited her friends about her volunteer work, saying that “some of my friends would like to volunteer.” When she is in the museum, Dinora regards herself as a representative of youth by, and through, her participation and interaction with other children. How important are communication skills for young people to share their opinions and ideas with others especially in a bilingual nation? Do these skills help develop self-esteem? Communicating well is integral for young people to present positive messages about themselves to other young people. Dinora and May saw the acquisition of new languages as important to improving their overall skills. Both say that acquiring language skills has helped them overcome shyness and given them confidence. “Even thought I am in French immersion at school I can practise my French here,” says Dinora. “It helps me be stronger in French and a better communicator. I am shy. Working here has helped me overcome this. I feel special and when I am asked a question. I can answer and I become the expert.” As for May: “My first language is Arabic. I speak English and am learning French. I really want to speak French better. It is like a dream for me. I have found mentors [at the museum] that are helping me with my communications skills. I watch them and try the same things when I am speaking to people. I am using these skills at school work and I will use them when I get a job.” The CCM provides an especially good atmosphere for young people to build these skills, which provides them with excellent opportunities to respond to visitor’s varied language demands. They are trained by a fully bilingual animation staff and come in constant contact with an international audience of visitors. Working in the museum allows young volunteers from various cultural backgrounds to express new points of views to visitors. May and Dinora in particular have brought with them a perspective, delivering content knowledge through interpersonal skills. These skills help them express their perspective of the world to visitors. Their voices are a clearer and more powerful way to reflect their community’s perspective. Content is validated for visitors in a personal way, and consequently respect for their culture is affirmed. Finding one’s place in various communities, knowing and being comfortable with one’s position and one’s relationship with others, and acquiring new knowledge is part of the development experience. Add to that communicating through various languages and you now understand the development experience of new Canadians. May and Dinora are developing new positions as teachers and as role models, in their relationships with young children at the museum. Teaching has expanded their learning base about other people, their communities, both old and new, and the world around them. Participating in the delivery of public programmes has built their self confidence. Their involvement also expands the museum’s programme content: their diverse perspectives shed new light on exhibitions for all visitors. How do you define your place in the world and where you fit? Where can you learn the tools that are necessary to communicate your views, opinions and ideas? How can you develop the skills so you will be heard? What does a museum experience provide for young people that they can get nowhere else? Dinora and May are discovering themselves in relation to others and developing tools that help them express their own identity. As well, their museum experience has helped develop their sense of identity as new Canadians as well as members of the Lebanese and El Salvadorian cultures. For all children, the Museum is an excellent place to work on communication skills, by learning how to speak to others and be respectful of what they have to say in return. The Canadian Children’s Museum serves as an active space for language development. In our supportive and ungraded learning environment, these girls have felt comfortable enough to practice their communication skills. The confidence gained from this experience has in turn strengthened their interpersonal skills. The CCM encourages them to share their own personal experiences and embraces them as an integral part of our museum’s experience. These children know CCM is a place where they can make a contribution to the community at large. The crossing over from being passive observers to becoming active participants, by expressing themselves personally, these young girls have been give a voice. They have the best of all worlds. Lynn McMaster, Manager, Programme and Canadian Children’s Museum Planning, has worked at the Canadian Children’s Museum since 1989. I would like to acknowledge the assistance of Carla Baggio, Volunteer Co-ordinator for putting me in touch with these two aspiring young women and to Dinora’s and May’s families who introduced them to our museum when they were young.